Lately I seem to have gone cartoon mad, and I’ve fallen in love with Pokemon again! When I was growing up I had a massive collection of Pokemon cards, I had about 5 of each card. Pokemon was the best. 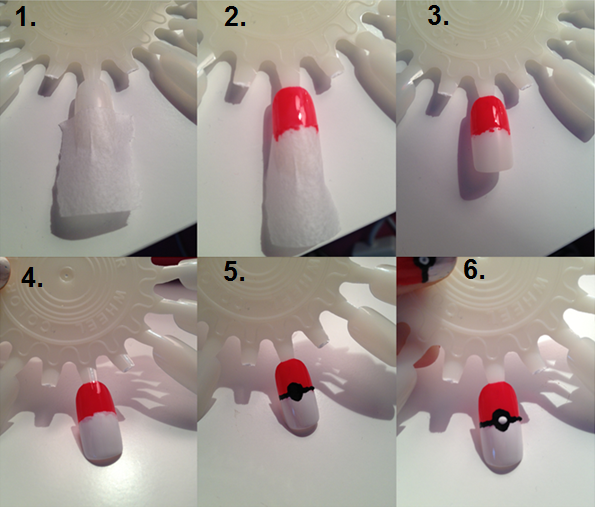 Anyway I decided to look up some Pokemon nail art ideas, I came across Pokemon ball nails, so I had to try them. I loved it so much I thought I’d share with you how I done it. Apply the masking tape half way down the nail to stop the red nail varnish getting onto the bottom half of the nail. Paint the top half of the nail red. After allowing the red nail varnish to dry, peel off the masking tape. Paint the bottom half of the nail white, be careful not to get the red. Using the black nail art pen, paint the line and circle on. Using the white nail art pen, paint on the tiny little white dot in the middle of the black. And BOOM your super cool Pokemon ball nails are all yours!